This is a possibly daft idea I had to build a "carriage swapping" model using LEGO® EV3 components. It was inspired by the High Altitude Conveyance System. The build instructions are available as a PDF, or LDraw file if that is preferred, from the resources section below. Note: This cannot be built from just the 31313 kit alone. It uses extra parts that I obtained from the 45560 Educational Expansion Kit, and some extra 11x5 and 7x5 open centred frames. Once the Swapp3r program is started you will be prompted to align the three arms. Using the brick buttons each arm in turn, left to right, may be moved rapidly using the left/right buttons or a few degrees with top/bottom. The arms must be aligned vertically and at the bottom-most position. Press the middle button to okay each arm's position. After the arms are aligned the right arm will rise to the top and you can then hang the carriage. Again, press middle to register that the carriage is hung. The Swapp3r will then proceed to rotate the arms, and then pass from arm to arm, showing the different passes where the originating arm is going either clockwise or counter-clockwise. Note: it is really important that the Swapp3r is on a flat surface and that the arms are aligned correctly. Otherwise it is possible that the arms may get locked together inside the carriage. This is most likely to happen to the left and middle arms. Basic/Test EV3 File - Some EV3 code for the Swapp3r. Updates to the project are noted below. 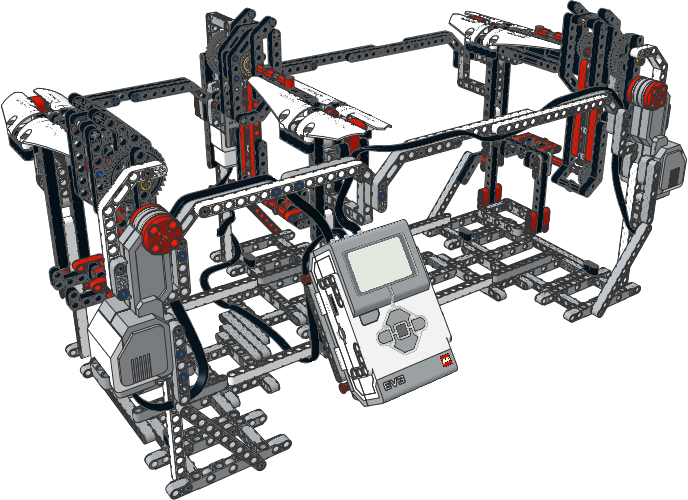 Where relevant EV3 code, LDraw files and PDFs will have been updated to match. Based on a work at http://jander.me.uk/LEGO/swapp3r.html.